BULAWAYO, ZIMBABWE, Nov 3 2015 (IPS) - Zimbabwe’s planned Batoka Gorge power project on the Zambezi River is expected to generate 2,400 megawatts (MW) of electricity, upward from an initial 1,600 MW, but the worsening power cuts that are being blamed on low water levels have renewed concerns about the effects of climate change on mega dams. In the past two months, the country’s energy utility has increased power rationing, with rolling power blackouts being experienced for up to 20 hours across the country per day. Zimbabwe has for years relied on hydroelectricity, and is one of a number of African countries that are banking on hydropower to spur economic growth, with multibillion dollar dams expected to generate thousands of megawatts. While there is no timetable of when construction of the 3 billion dollar Batoka Gorge Dam will commence and whose eventual economic dividend will only be realised after a decade of construction, it will add much needed energy in Zimbabwe where power generation stands at around 1,600 MW against a national demand of 2,200 MW. 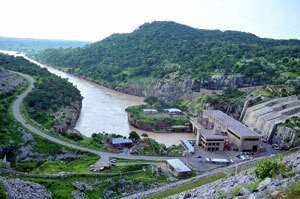 Officials say on completion of the Batoka hydropower plant, the country will be a power exporter. However, the long running power crisis has stalled economic expansion and has in fact forced the closure of major companies, the latest being Sable Chemicals, which was this month switched off the national grid in what energy minister Samuel Udenge said was part of short-term strategy to avail energy to other sectors. But the switch-off forced the country’s sole fertiliser plant to shut down operation and left more than 500 employees jobless, company officials say. The company owes the power utility 150 million dollars. According to Minister Undenge, 80 per cent of Zimbabwe does not have access to electricity, and the Batoka Gorge hydropower plant, a joint project with Zambia that will draw water from the Zambezi, a transboundary water body shared by eight countries, is expected to boost power production and bring electricity to remote rural areas. Early this month, Minister Undenge told parliament that the Zambezi River catchment area was affected by rainfall the patterns of other countries. “Water is still flowing into the Zambezi River from the north, but we are drawing more water than what is flowing in, hence the continued decline in the water level,” Undende said, explaining the reduced power production. It is these concerns about low water levels that have experts worried, with questions being raised about whether mega dams are viable investments in the long term, citing climate uncertainty and concerns about reduced run-off that would affect dam water levels and ultimately reduce power generation. In fact, the worsening power crisis in both Zimbabwe and Zambia is being blamed on low water levels at the Zambezi river. Researchers at International Rivers, an organisation that looks at the state of the world’s rivers and how local communities can benefit from them, warn that the big dam projects could be rendered useless in the long term because of climate change and reduced run-off. They favour smaller dams for localised power generation, but smaller dams also cost money which Zimbabwe does not have. Last year, the climate ministry announced that the country will be constructing more dams to cushion the county against climate uncertainty, at the same time advising heavy industrial electricity consumers to construct their own power generating plants. In the absence of these private power generators, the Batoka Gorge Dam is being touted as the ultimate solution to the longstanding energy deficit despite warnings that the project could present its own problems as it does not address climate-related future realities. Peter Bosshard, Interim Executive Director of International Rivers, says the Zambezi river basin, the location of the Batoka Gorge Dam, has one of the most variable climates in the world which will increase the dam’s hydrological risks. “The (UN’s) Intergovernmental Panel on Climate Change (IPCC) has warned that the river (Zambezi) may suffer the worst potential climate impact among eleven major African river basins,” Bosshard told IPS. But Hodson Makurira, a senior hydrologist at the University of Zimbabwe does not agree. “That would be an oversimplification of a complicated and highly uncertain projection of future events,” he told IPS. “The same climate change predictions are forecasting an increase in extreme events, droughts and floods. You would (then) want to capture as much flood water as possible through increased storage. That would cushion you against periods of low flows,” Makurira said. “Nobody knows the exact magnitude of reduction in flows due to climate change so it may still make economic sense to build dams,” he told IPS. “The project is based on historical streamflow data, which do reflect future realities. Investors, financiers and tax payers should be aware that the studies for this multi-billion dollar project seriously over-estimate its economic viability,” Bosshard said. But for Minister Undenge, who is increasingly under pressure to solve Zimbabwe’s energy crisis, neither financing nor climate change will stop this ambitious mega dam. I’ve been down the length of the Batoka Gorge. It’s very narrow and deep. With little room to hold water (unlike, say, Kariba downstream), the projections for power production strike me as unrealistic even assuming decent upstream precipitation.